I hope your week is going well. I’d like to press the pause button on this month please. I need the autumnal vibe to hang around a little longer for me to savour, before everything just turns wet and freezing! I’m pretty excited, as I have a couple of collaborations in the pipeline with The Real Flower Company, and I wanted to share this first one with you. For a long time I have loved their exquisite flowers and greenery, so when they got in touch asking if they could gift me these beautiful blooms, I was of course over the moon. Now that my garden enters it’s winter slumber, the thought of having to go back to supermarket flowers doesn’t really inspire me, especially after I have been so spoilt for the last few months with my own floral bounty. So when a gal who loves beautiful blooms is offered flowers to play with and photograph, it’s a bit of a no-brainer! The Real Flower Company are award winning florists, using gloriously scented roses, herbs and foliage which are grown on their own farms. Their farms are sustainable, Fair-trade, and their carbon footprint is as low as it can possibly be. 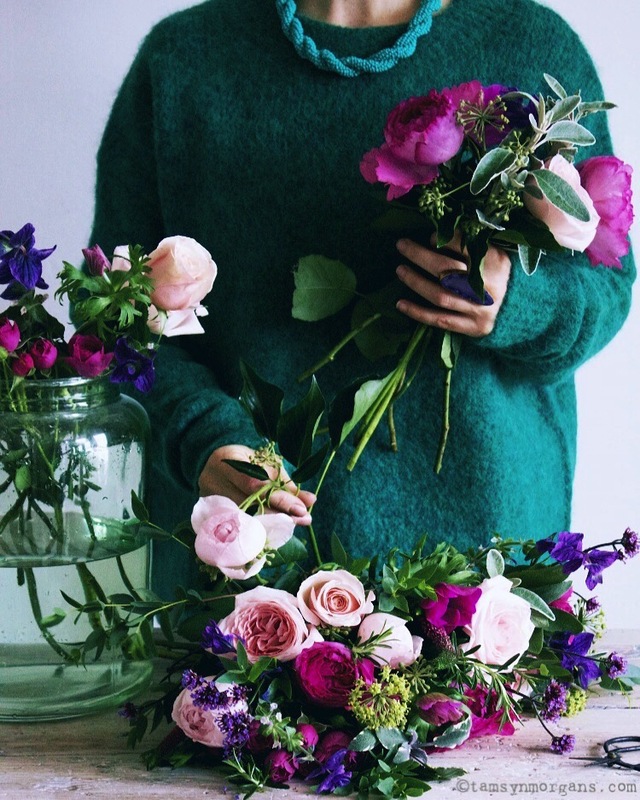 They have a gorgeous shop in Chelsea, and seasonal blooms are hand tied into stunning bouquets. One of the reasons they sent me my bouquet, is so I could help spread the words about their new Instagram hashtag (see their Instagram here), #realflowersoftheseason (tag your pictures of your own blooms!). I had fun pulling this shoot together, I knew that I wanted a teal coloured backdrop to make the colours of the flowers pop , so I made this one using a roll of lining paper. Speaking of backdrops, I’ve signed up for the amazing Kim Klassen‘s Backdrop Making Class next week which I’m super excited about. I adore Kim’s photography, so to learn how she makes her canvas backdrops is going to be an absolute delight, as I’m a massive fan of her work. Hi, that teal colour is beautiful… is it possible you could tell me the make and actual colour. I love your page, dip in every few days to catch up.